Admission: Free to members, $5.00 for non-members. Hours: 7 days a week, 10:00 a.m. to 4 p.m. If you haven’t been to Mounts Botanical Garden in a while, take some time and visit especially during this time of year. Cooler, drier fall and winter season is especially delightful and much more enjoyable as you stroll around the paths of the garden. With the busy and often stressful Holiday season upon us, it’s always a blessing to be able to go to a place where you can unwind and recharge your senses. 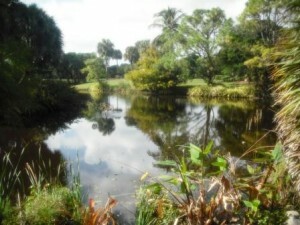 We are so fortunate here in West Palm Beach to have such an awesome place we can visit often. Mounts Botanical Garden also hosts their annual spring and fall plant sales where shoppers come and choose from several variety of fruit trees as well as many other specimens, succulents and specialty items. As you enter you find a perfect little area with wooden chairs, benches and a rock water fountain welcoming you to this blissful place. Beautiful display of white and red poinsettias in large pots add to the seasonal theme. 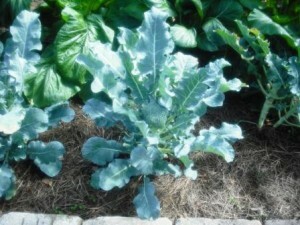 With so many different gardens, it’s the best place to get ideas for your own front or back yards. Even the smallest of yards can be transformed into a special place. As you walk around, there is so much to discover, so many different and unusual species, all the plants’ names are posted, lots of color and beautiful water views. If you come near the water’s edge, you can spot turtles and colorful koi fish of all sizes. Many paths lead to different gardens. 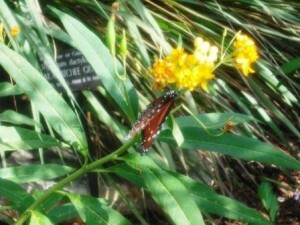 One of my favorite was the butterfly garden which had many butterflies and bumblebees. Don’t miss the well designed children’s maze garden as well as the cool and shady tropical forest garden. There are several arbors, bridges, fountains and benches to sit and relax. 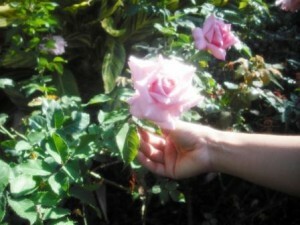 Take time to smell the fragrance of the beautiful roses. 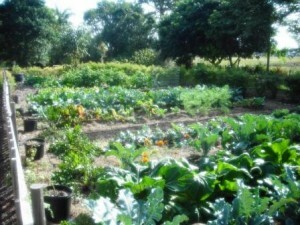 The vegetable garden was a total delight to the senses with a variety of vegetables suitable for anyone’s backyard. One section was closed off and is under construction. Coming soon will be the Windows on the Floating World, a wetland garden with see-through walkways and aquatic plants which will allow visitors to feel and connect to the tropical wetlands around them. 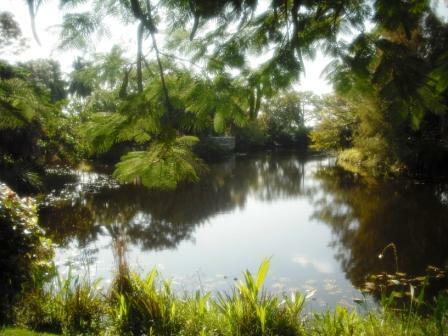 So, if you have friends coming down for the Holidays, bring them along for a visit to Mounts Botanical Garden. 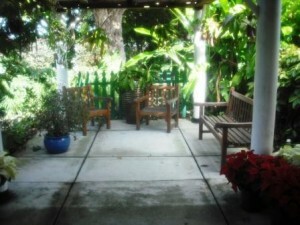 Everyone can benefit so much by spending even an hour or two surrounded by the splendid views of the garden. Great place to recharge with the sights and sounds of nature. Health and Wellness, Nature Trails - Nature Centers, Other Places to Visit. permalink.